Macular pucker, also known as an epiretinal membrane or cellophane maculopathy, is the formation of scar tissue over the macula or the central portion of the retina. The retina is the light-sensitive film at the back of the eye, which converts light into an electrical signal that can be interpreted by the brain. The macula is responsible for detailed vision and, thus, functional vision, necessary for reading and driving. Fortunately, a macular pucker is treatable. A macular pucker is usually diagnosed through examination of the retina with a microscope and special lenses. When the condition is present, a membrane or film will appear on the retinal surface, distorting retinal vessels and causing the retina to swell with fluid (edema). Additional tests include the use of fluorescein angiography, to determine if there is any associated condition such as a blocked blood vessel (e.g., “vein occlusion”). The angiogram can also reveal leakage from the distorted blood vessels of the retina which, when present, may lead to more rapid and irreversible loss of vision. 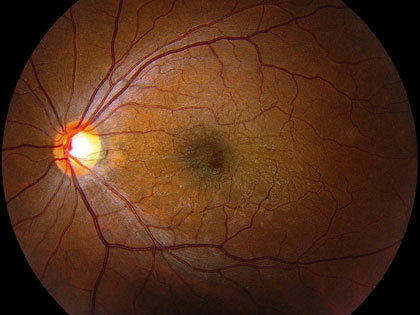 Optical coherence tomography (OCT) is useful in the identification of the pucker itself (the membrane on the retinal surface), in measuring the amount of edema and in identifying the presence of additional damage to the retina (e.g., lamellar hole), which may limit the prognosis. The most common cause of macular pucker is the aging process. Aging of the vitreous — the jelly-like substance that fills about 80% of eyes interior and helps to maintain the eye’s shape — initiates the process. As the vitreous ages, it shrinks and pulls away from the surface of the retina causing “traction”. The traction (or pulling) by the vitreous creates cracks in the surface of the retina stimulating a healing response. Part of this healing respons is the growth of scar tissue on the retina surface, forming a membrane. Contraction of the membrane or scar tissue causes the macula to “pucker”. In most patients with macular pucker the vitreous has detached completely (posterior vitreous detachment) and since this occurs as you age (typically after 65) most patients with macular pucker are elderly. Macular pucker may also occur after intra-ocular surgery – particularly in cases where retinal tears or a retinal detachment has occurred. Indeed, 15% of patients with a macular pucker have a retinal tear already. Other exacerbating factors include internal inflammation, swelling, holes, tears, or trauma. An onset of flashing lights or floaters may be a warning sign that a change is taking place within your eye. Signs of macular pucker include blood vessel distortion, due to the presence of scar tissue on the retina. This can be difficult to detect; sometimes, an abnormal light reflex may be the only clue. Symptoms range from nonexistent to severe. There may be blurring of central vision, distortion (metamorphopsia), change in the size of objects, double vision, and/or loss of depth perception. In cases where the affects on vision are minimal, it is unnecessary to treat macular pucker. When the change in vision is mild and retinal edema is present, some patients will respond to anti-inflammatory drops or injections. When the affect on vision is profound, marked by significant vision loss (e.g., 20/50 or worse), double vision or loss of depth perception, a vitrectomy and membrane peeling may be required. We use no-stitch, minimally invasive procedure and other surgical techniques, developed in part by the specialists at the Retina Macula Institute. Together we achieve the best possible results for our patients, successfully treating the most complex cases.